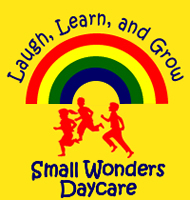 Small Wonders Daycare Center was founded in 2001 with your child in mind. Small Wonders Daycare was created to provide a safe, nurturing, and structured learning environment for your children. We take pride in providing highly skilled early childhood educators with many years of experience. Our structered preschool or nursery school, will provide your child with a head start when they enter kindergarten. Please contact us and arrange a visit so we can share the Small Wonders experience with you.